Paintings are not just what they look like. How we see them is often measured in terms of the wider network of connections associated with a given work. Those networks are created by the artist, environment, social conditions, art history, trend etc. Making exhibitions allows an artist to more proactively set the terms of the discourse of associations. Sheenagh Geoghegan’s exhibition ‘Stoma’, at the beautiful Source Arts Centre gallery space in Tipperary, explicitly sets out to do this. 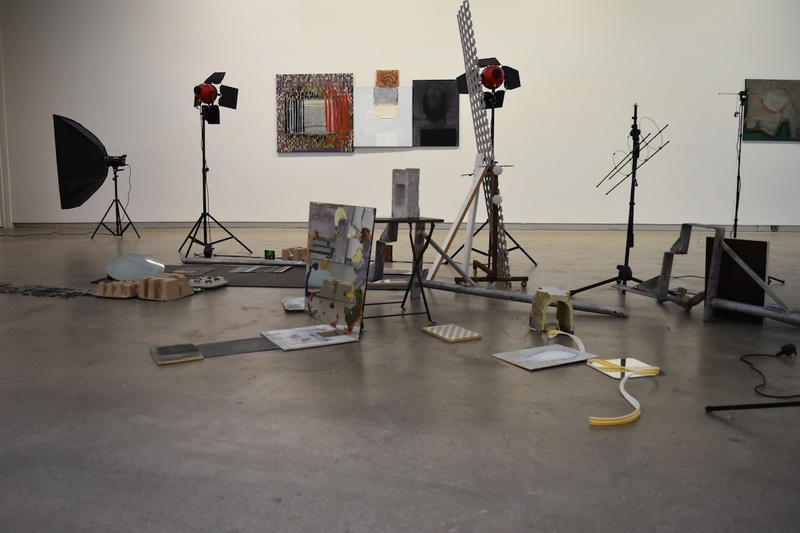 On the walls of the gallery Geoghegan’s paintings orbit around a constellation of scattered objects sprawled out on the floor. The abstract canvases, sometimes combined together, are composed of a mixture of dense graphic and painterly forms. The objects they surround (industrial and photography lamps, construction and art materials, and other miscellaneous items) are not presented as ready-mades. Rather, they participate as gestures and marks in the wider formal politics of a painting exhibition. This convergence of painted works and the other things the artist has situated in the gallery simultaneously connects and confuses (in a good way) the flow of associations between elements. A linear or blocky quality to most of the objects strewn on the floor is mirrored in the language of many of the paintings. In certain instances objects and paintings swap places. Canvases find their way onto the floor and likewise a mirror hangs where a painting might. As these connections are made, others are broken down. The installation creates both physical and optical barriers to our predetermined and routine models of navigating our way through and viewing paintings in an exhibition. You get the feeling this is precisely the artist’s point: to reshape our negotiation and experience of the familiar. Simply placing objects onto the floor of an exhibition space, without intent or strategy, will far from guarantee this. It is Geoghegan’s particular synthesis of formal / material / spatial rhyming and controls that make this exhibition deliver on that front.